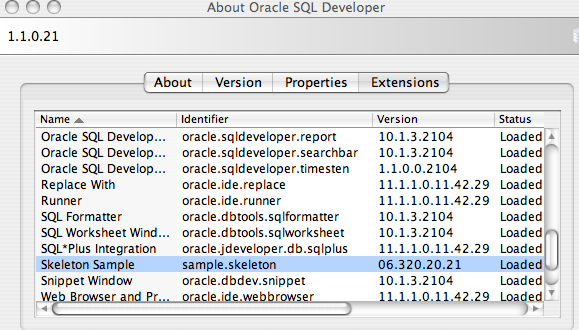 Sue had blogged on how to get an extension started in jdev in 10 steps. In the presentation at OOW, I showed how little code it could take to start an extension and said we'd get a skeleton out of how to start one yourself. Well here's the Skeleton and here's a zip of it. With this skeleton, there's 3 steps to getting started with an extension. Step 1: Download the zip. 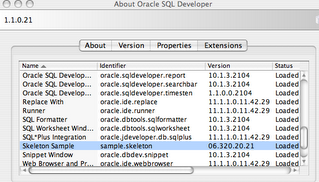 Well it's done and deployed to your local copy of sqldeveloper. Wasn't that easy and painless? 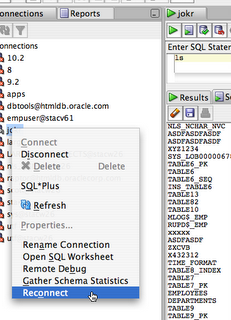 :-) Take a look at the Help->About and the Extensions tab will show the name from Step2. This added 2 things. First an ls command when a script is run ( F5 ). Second a Reconnect on the connection. Here's a screen capture of both. By implementing and registering a command listener, an extension writer has the ability to add new command and listen in on when commands are run as scripts. Hopefully the names on the methods are pretty simple. The beginScript is before anything is run and endScript is after everything. The other 3 are before each command, after each command and the command itself. So in this case I only implemented the handleEvent so I could process the ls then finally return a true to say I did something. 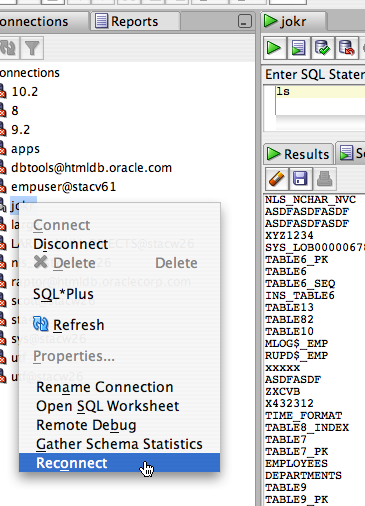 In this launch, all we did was get a handle to the connection which will cause the framework to reconnect if the connection was dropped and put a status out to the toolbar. Now that everyone knows how to get started with extension, we should see lots of cool stuff. When you do create an extension drop Sue or myself a note and we'll add it to the list of known extensions.